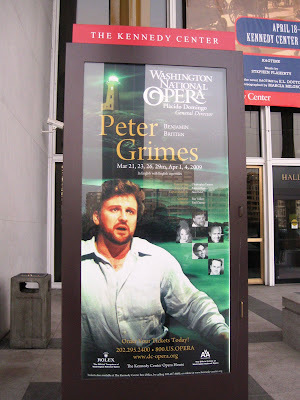 I haven't had a chance to tell you about Peter Grimes at the Washington National Opera last Saturday! Sally and I traveled down via the reliable and oh so cheap MegaBus. We were hosted by the gracious and always energetic Wanda (Pimento cheese sandwiches! Maker's Mark!). 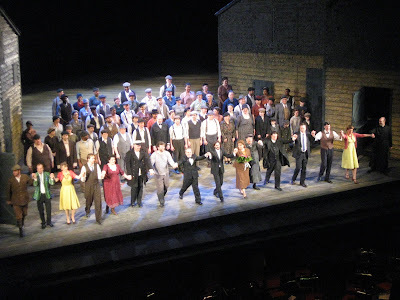 I loved Peter Grimes last year at the Met. I love the haunting music and story. It's very theatrical and would read well as a dramatic play. It's about a fisherman named Peter Grimes who is sort of an outcast. He's under suspicion regarding the death of his apprentice. When a second apprentice dies, the fishing village are quick to judge him, although whether or not he's guilty is ambiguous. 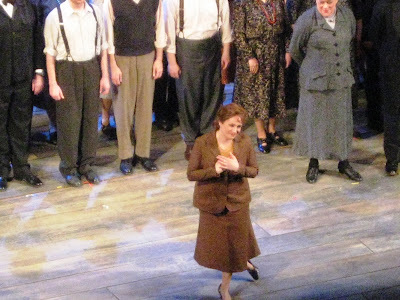 Patricia Racette also played the character Ellen Orford in the Met's production and the draw to see her again was great. Ellen is a widowed school teacher who attempts to help Peter and his second apprentice. Peter would like to marry her, but its unclear if she is attracted to him as the man or just wants to help him because she sees the need and is against the unjustified conclusions of the villagers. It's a tragic and dark story, full of emotion. This production was set sometime early 20th century, about the time that Benjamin Britten wrote it. The set was interesting and moved to create a very tight space, evoking a feeling of narrow-mindedness of the village. The music is absolutely gorgeous, and at times made me feel like I was listening to the sea. Christopher Ventris as Peter Grimes was stunning. He played Peter very angrily. His voice is very commanding. I never thought of him as a poor soul, but definitely as a bitter one. Patricia was wonderful, of course. I recently heard her described as the Cherry Jones or Meryl Streep of opera. That description is not far off the mark. Opera is big by nature, but Pat's acting makes it feel like an intimate experience. The trip down was well worth it, plus we had the opportunity to hook up with other good friends and celebrate dear Cordellia's birthday. We were also there just on the cusp of the cherry blossoms. I still can't get this performance out of my head. Wow - we left after the 1st act. Too loud and too strange. Every reviewer has loved this production -- maybe we were just not in the right mood for this? Too bad that you didn't stay and give it a chance, Anon. I'd say your loss. I love the dark reality of this opera. The music is rapturous.